“Did you know that 50% of all new Internet connections in 2009 will come from mobile phones?“, says Google. What are you doing to reach this vast new market? Is your blog equipped to reach your message to them? We can mobilize your Wordpress or Semiologic blogs. 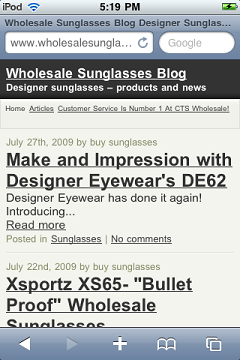 Anyone visiting your blog from an iPhone or another smartphone like Blackberry, Nokia etc will get to see a version specially created for the compact screen and interface available on the mobile device. The switching from the desktop browser version to mobile browser version is fully automatic and there will be a link on every page to switch back to the desktop browser view if one needs to see that. While most phones can render text from a regular web page, formatting and overall usability often get lost. The mobile-friendly version of your blog makes sure your branding and visual style get through cleanly, and ensures your customers can read or see what you have to say. This will allow people accessing your blog from a mobile to be able to comfortably read what you have to say. More people will now consume your posts. And may be become subscribers, looking forward to your next post. Are you wondering if this is going to be an expensive affair? Relax! The fee for this service is only $30 per blog. The turnaround time is 24 hours on average – lesser than that most of the time. 1. Pay $30 by Paypal to arun @ ebizindia.com (Remove spaces from the address). 2. Send an email to the this email address – include the payment reference, blog’s FTP Details and admin details. We will update your blog within 24 hours and you can start reaching the new readers just after that. A blog post announcing the new feature works like a charm to notify the readers of the new access channel.